Use the Post-Call Action webhook to enable real-time, data collection capabilities for phone calls. The Post-Call Action webhook allows users to enable real-time, data collection abilities for phone calls, upon call completion. As a result, the user has access to all manner of call-detail information they may find useful. The Post-Call Action interface functions to assist the user in generating a fully-qualified web URL. This URL is then filled in with the appropriate, dynamic information that corresponds to the phone call that the user has selected. After which, a "REST" API call is launched to the specified web server. This action delivers the desired data in near real-time, as each call completes. The data reported by a Post-Call Action may be simple or complicated. This webhook is a powerful capability that leverages the same, everyday technology used to surf the Internet (e.g. HTTP). Phone calls may have multiple post-call actions. This adds additional informational capabilities for the webhook that may be useful for the user. The Post-Call Action webhook allows users the ability to specify the dynamic parameters in the URL. These parameters act as placeholders for call-specific data. The dynamic parameters are assigned in the Post-Call Action configuration interface from a list that is generated from the Post-Call Action Option drop-down menu and based on its values. When a Post-Call Action is executed and before said process is completed, the dynamic parameter values are substituted to include the corresponding pieces of call-specific information. Any number of placeholders may be used and in the desired order. Click the Developer Tools option. Click the Post Call Actions option. To create a new Post-Call Action, click the "Create a new Post-Call Action" link that can be found towards the bottom left of the screen. A user can have multiple Post-Call Actions. 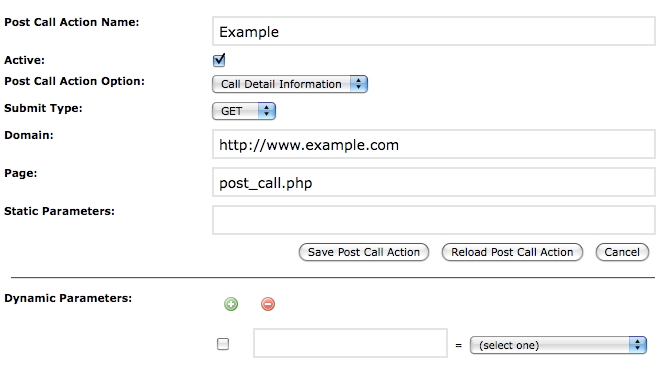 A new Post-Call Action is created by clicking the Create a New Post-Call Action option. Check the Active box; it may be disabled, at anytime, by un-checking the checked box. Set the Submit Type to GET or POST, as appropriate. The Post-Call Action Option should be selected for the "Call-Detail Information" option. The Google Analytics® option is used to send call information to a users Google Analytics account and is configured separately within the SourceTrak Application. The Page field is the name of the file on the user's server that will be used to process the information submitted via the Post-Call Action. This field may contain sub-folders, if the user's file does not exist at the root level of their web server. For example, if the user's page resides at http://www.example.com/files/ibp/post_call.php, the user must enter /files/ibp/post_call.php in the Page field. Dynamic parameters store phone-call data that is sent to the user's server. The user has the ability to specify the information desired and label it, according to preference. Click the green button with the plus symbol on the top portion of the Dynamic Parameters screen. Select the desired parameter from the drop-down menu. Enter a name for the selected parameter. This name will serve as the parameter key that may be used to access the parameter, when data is transmitted to the user's web server. There is an example URL below the parameters that shows how the URL that gets submitted to the web server will look like. Click the link to test the Post-Call Action. The example shown below, using the Date/Time and Caller ID parameters, illustrates what the corresponding URL for those parameters looks like. When the phone call completes, the data for the selected parameters for that call will be sent automatically to the user-specified URL. The dynamic parameters are described in the table below. The list of all actions taken by a caller or call recipient. The description of the Click-to-Call that initiated the call if applicable. The length of the call in minutes. The type description of phone call, such as inbound, outbound, click-to, etcetera. The local or toll-free phone dialed to initiate the call. The phone number of the person who called. The ID of the Click-to-Call that initiated the call. The date and time information for the start of a phone call. The talk minutes for a recorded phone call. The first action type to handle the call, such as a Virtual Receptionist. The time spent with the Find Me or Virtual Receptionist features, while waiting for the call to connect. The last action taken on a phone call. The city information captured by the Reverse-Lookup service. The first name information captured by the Reverse-Lookup service for the caller. The last name information captured by Reverse-Lookup service for the caller. The state information captured by Reverse-Lookup service. The street address information captured by Reverse-Lookup service. The zip code information captured by Reverse-Lookup service. The text-string label configured for a phone number within the Phone Routing option. The duration of a call recording. Enhanced minutes that are rounded up to the nearest, whole minute. Intelligent minutes that are rounded up to the nearest, whole minute. Talk minutes that are rounded up to the nearest, whole minute. Session ID (SID) refers to the unique, session ID for a phone call. The total minutes used during the duration of a phone call. The transfer type for a phone call. For example, if the call is transferred using Virtual Receptionist, Click-to-XYZ, etcetera. The phone number to which a call is transferred. The Value option is only available when the Reverse-Lookup Service feature is enabled. If the Include SourceTrak Information option is enabled using SEO or PPC pools, additional parameters become available to the user in the Post-Call Action (Does not apply to one-to-one calls). Also, all available SourceTrak parameters become included in the Post-Call Action request. The SourceTrak parameters are described in the table below. The SourceTrak pool activity that triggered the number display on the website. The landing page of a user's website, where the SourceTrak phone number is initially displayed. The web browser used during a SourceTrak session. The ad campaign captured by a SourceTrak session or a default value set in the SourceTrak configuration. The date and time (EST) that the SourceTrak phone number is first displayed on the user's website. The title of the initial page view, during a SourceTrak session. The ID of the SourceTrak Domain Set for the phone number called. The Google Click ID (Gclid) captured from a Google Adwords visit. The Google Universal Analytics Client ID captured during a SourceTrak session. The optional, custom value passed into SourceTrak. The optional, unique ID value passed into SourceTrak. The IP address of the visitor during a SourceTrak session. The name of the location that received the call when multiple numbers are displayed on a page via SourceTrak. The operating system used during a SourceTrak session. The unique identifier for a SourceTrak session. The Ad Platform captured by a SourceTrak session or a default value set in the SourceTrak configuration. The SourceTrak pool name for the phone number called. A general confidence indicator (on the scale of 1-5) of how a phone call is matched to a source; a lower rank indicates a higher confidence. The referring domain, which results in the display of a phone number on a user's website. The literal search string or keywords that result in the display of a phone number on a user's website. An indicator that determines if a phone call was made to a SourceGuard number. The PPC ad or URL parameter that triggered to the phone call.